Clouds of abundant pure white flowers which are strongly scented, followed by long lasting small yellow fruits make Golden Gem (Malus 'Golden Gem') a particularly appealing flowering crab apple variety. Golden Gem is also a good pollinator for other apple varieties. A crab apple tree considered to have above average disease resistant qualities when compared to other crab apple trees and will attract various forms of wildlife to your garden. A small height tree, so expect a height of up to 4 metres after 10 years and a similar spread. This tree will benefit from an occasional pruning to thin out the branches to promote new growth. 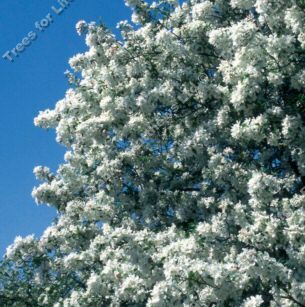 This crab apple tree is listed as clay tolerant and will perform well in fertile well draining soils. This tree is supplied at a height of between 150-200cm in a 7-15 L container for year round planting and better results than from either bare-root or rootballed stock. This is because the roots are undisturbed for the whole time we have the tree.